Last week, in the midst of rain that fully sustains Oregon’s reputation for winter weather, though coming unusually early in the season, we stopped over a day at Milwaukee and took occasion to call on Mr. Seth Luelling, an old subscriber to the FARMER, and on of the most experienced nurserymen in our State. Mr. Luelling lives in the town and quite near the river, while his orchard and nursery extend over a good deal of ground between that and the railroad, half a mile distant. It is quite a treat for a person who enjoys fruit to see such a fruit house as Mr. Luelling has, containing hundreds of bushels of choice apples and pears, and to observe the process of gathering and putting away what still remained in the orchard. The Milwaukee Nursery also has a goodly array of grapes hanging upon the vines, of many different varieties, looking luscious enough to make an epicure’s mouth water. Mr. L. showed us specimens of dried plums and prunes, raised and preserved by himself, that are excellent evidence of the future value of such productions to our State. The nursery contains a very great assortment of fruit trees of all kinds, and the proprietors, (the firm is S. Luelling & Son), can fill orders to best advantage. They have made fruit culture a study for so many years, and attend to their business so conscientiously, that the Milwaukee Nursery has earned a valuable reputation. One feature of the Luelling household strikes a stranger singularly, for the family are strict vegetarians and abjure tea and coffee, meat of all kinds, salt, pepper, spices, butter, grease in any shape and do not use fine flour even. We shall take the liberty of giving the bill of fare at the dinner table, judging from the zeal with which the whole family preach and practice the vegetarian theory that they will not object to a friendly notice. The drink was milk or water, the solids were mashed potatoes, flavored with milk without salt, cabbage nicely cooked with milk, baked squash, delicious baked pears with sugar or syrup, which we used freely, some of the best graham bread we ever ate, and such other articles as were consistent with the vegetarian principle. The only criticism we are disposed to make is that we enjoyed the meal exceedingly, and after eating abundantly, rose from the table well satisfied and conscious that no foundation for ill health had been laid by the gratification of appetite. In this connection we cannot help but moralize a little over human nature and its weakness. We put entire confidence in the statement made by Mr. Luelling that during the thirteen years they have practiced this system of life, using cold baths also with regularity, the family has been free from disease, while all were more or less ailing previously, and Mrs. Luelling herself was a confirmed invalid. Mr. Luelling assured us that he had more strength now and better health, than when he was thirteen years younger and practiced the former diet. These things being so, we must conclude that the family possesses remarkable will power, or they could not turn appetite out doors and all become philosophers. Speaking of appetite, however, we were assured that appetite when once converted has a better relish for the vegetarian diet than it ever had in the olden times for “chicken fixings. For more background on Seth and his horticultural accomplishments, as well as some most informative writing on vegetarian practices in early Portland (and there was pretty darned little written before now! 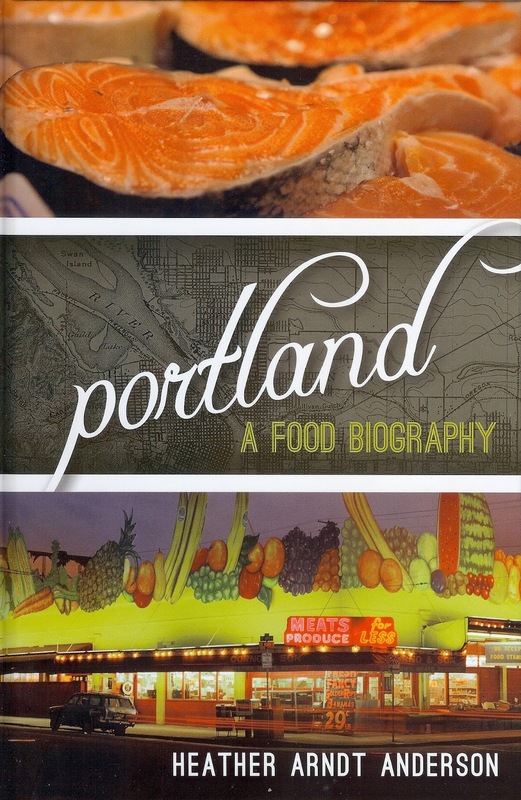 ), I recommend a new book by Heather Arndt Anderson, Portland: A Food Biography (Rowman & Littlefield, 2015). It’s a fascinating read!